My first sight of Still Alice…… | Which me am I today? I had the most amazing evening at my publishers, Bloomsbury on Wednesday evening. Me and my partner in writing, Anna Wharton, were there to do a short talk, along with 7 other authors, ours being about the launch of the paperback version next year. It has a wonderful new cover, but I’m not allowed to show that until someone says, ‘GO’😂. 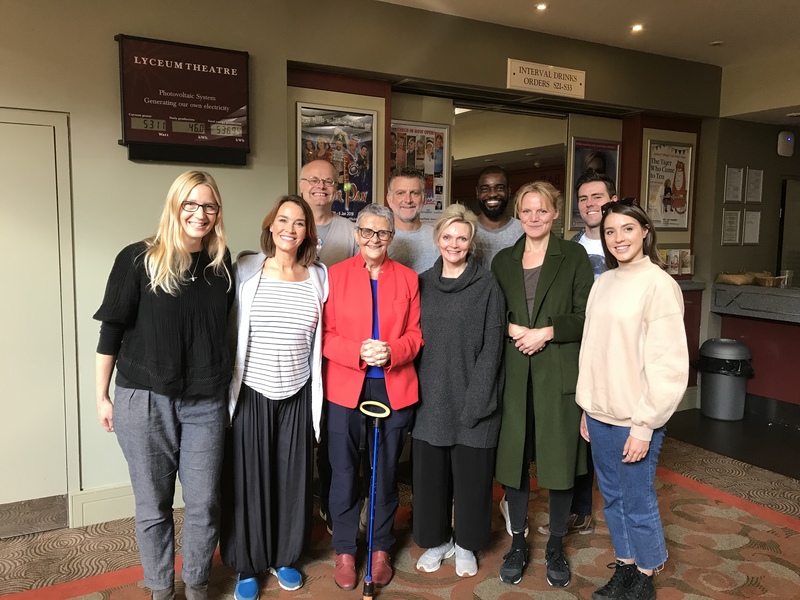 So Thursday morning found me trundling through a sunny London to St Pancras as I was heading back north to Sheffield to meet up with the new cast of Still Alice and watch their performance for the first time. It had its premiere at Leeds Playhouse with a different set of actors, so it would be interesting to see how the new ‘family’ settled in. 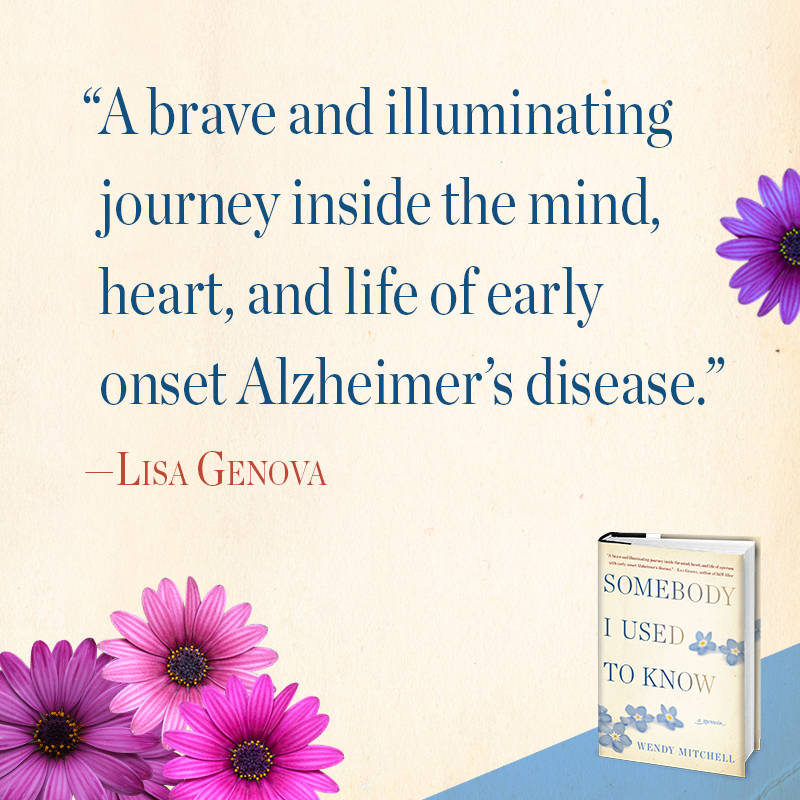 Lisa Genova, author of Still Alice kindly wrote this for my book in America. Nicky Taylor from Leeds Playhouse was meeting me at Sheffield station before heading for the theatre and barring a few delays on the train, we had plenty of time to trundle up to the theatre and have a cuppa tea. So now for my own review of the performance and those that know me know I will say if I don’t like anything or think something should have been done differently…….. Still Alice is the story of a Professor diagnosed in her 50’s and the play shows how it affected Alice and her family. Alongside Alice (Sharon Small) is ‘Herself’ played by Eva Pope. I describe Herself as the inner thoughts of Alice and compare her to what I call ‘my own self’ who also accompanies me daily. Before we knew it, the lights went down, the music started and Alice and ‘herself’ appeared on screen ……..and immediately they looked as one and at ease with one another. Eva Pope, playing Herself, timed her thoughts perfectly and her movement about the stage never distracted or confused as she effortlessly accompanied Alice on stage. It was weird to see different actors on a different set but within minutes it seemed normal.It was strange to see a smaller stage, but within minutes it was normal…..
You can’t compare one set of actors with another, but Nicky rightly said how it felt like we were experiencing two sets of families going through a diagnosis of dementia. The music between scenes was wonderfully haunting and was a great filler while scenes changed and props moved about seamlessly . Don’t remember that from before but maybe it was there…and I’ve just forgotten…. It was good to see the bunny slippers hadn’t been lost and other pockets of humour remained . Still made me chuckle…an important ingredient of the play. Herself looked like she was dressed in all black, which had a strange effect when the lights were dim. At one point her head was floating in the corner…..weird…but very funny. I learnt afterwards that it was in fact dark blue. It seemed different, but then they were different actors putting their own stamp on the part they were playing, but they flowed and jelled remarkably well for day 2 of a tour. The lighting seemed softer and sometimes just shone gently on Alice’s face and her expression was perfect and mesmerising……catching the lovely twinkle in her eyes. Once again, it was all in the eyes and Sharon has mastered the look perfectly. The sound of the microphone as Alice spoke her speech was loud and clear. It felt just as it does at a conference and made the speech so powerful. Slowly and discretely, the set became emptier and more sparse as Alice’s decline deepened. Sharon portrayed Alice’s decline sensitively, quietly, movingly yet perfectly. Her facial expressions, her mannerisms honed to perfection. The ending, with Alice and Jon sat in chairs on the beach ….beautiful. I remember watching the ending with Sarah and Gemma in Leeds. I remember us sitting waiting for everyone to leave the auditorium and then hugging each other in tears. I was glad they weren’t there to cry again. Poignantly the ending is Alice holding a book she wrote…. The theatre kept a small corner open for us to meet the cast afterwards after the audience had left. They heard our thoughts on the performance. My garbled emotions of happiness taking over but luckily ‘Myself’ had been typing throughout the performance. ‘Myself’ is the one who can articulate through typing whereas the outward me can show the emotional excitement I felt at the most wonderful performance by ALL the cast. And I finally got my hug with Sharon. I have booked to see it in Malvern…. looking forward to it! I’ve just seen it at Sheffield Lyceum. Oh my. 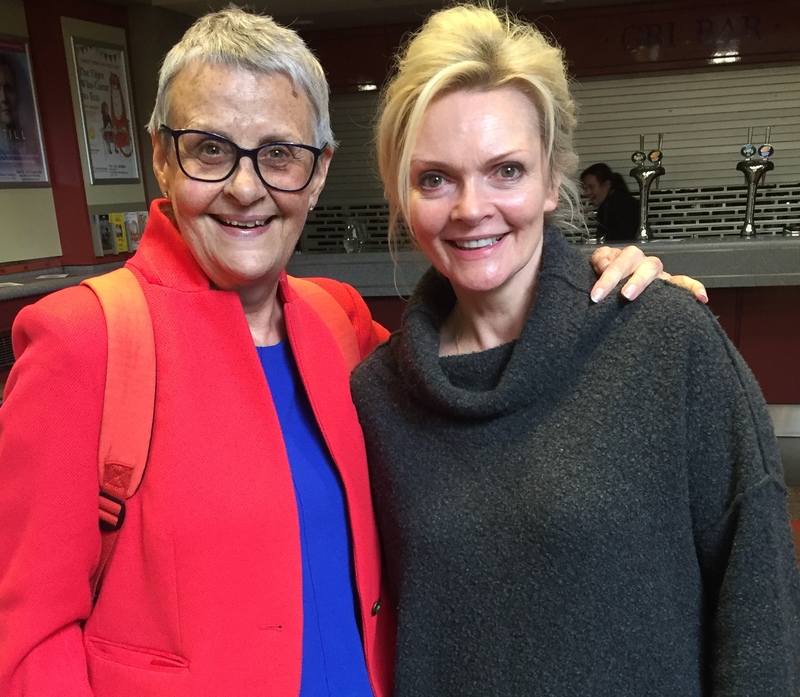 So movingly done, I thought Alice’s husband John and daughter Lydia were particularly good but Sharon Small is just extraordinary. Got a standing ovation and there were many moist eyes around me, including mine. 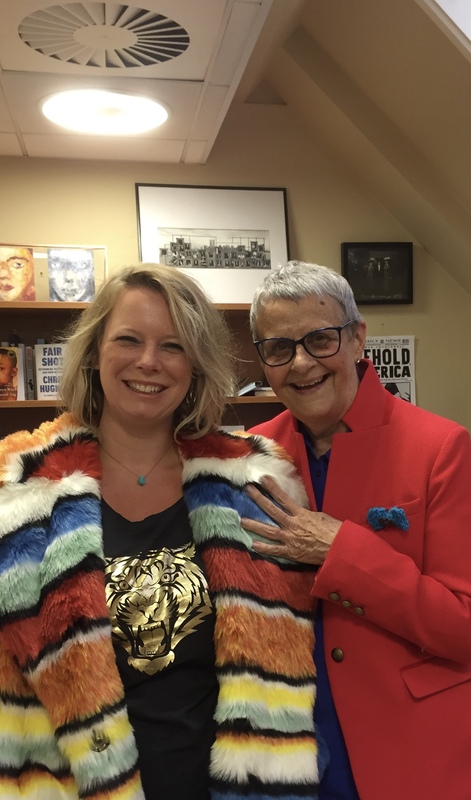 It must have been such a wonderful experience for you being so closely involved and I felt there were places where I could feel your influence!